We just passed the midterm mark of this current presidential term. While 2019 just started, conversations around who will be running for office against Donald Trump in 2020 are speeding up. Before we know it, it will be November 2020, and we’ll be back in the polls voting for the next president. So what do you need to know before then? Who is running, and how do you know who to vote for? 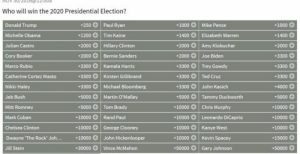 According to Ballotpedia, there are about 10 confirmed Democratic candidates running against Donald Trump, who filed for reelection for on January 20, 2017, the date of his inauguration. Many popular political figures may not be confirmed, but their names are still being thrown around as possible candidates of the race. Many politicians have announced exploratory committees, which is different than a confirmation of actively campaigning. An exploratory committee is a chance for politicians and those interested in running for office to present themselves amongst a political sphere, and determine if they should run in the race. Usually, it starts as a stepping stone to officially run, which is what Senator Elizabeth Warren has done. A Democrat from Massachusetts, Warren has been in the news headlines a lot throughout multiple debates with President Trump. After an exploratory committee, she has confirmed her decision to run for President for 2020. Her progressive focal points have gathered enthusiastic crowds in Iowa and New Hampshire, with people in support for her dedication to foreign policy, pharmaceuticals, student debt, end to political corruption, even with a continued investment with a capitalist system. Another candidate that has everyone talking is Kamala Harris, who is a Democratic senator from California. Rolling Stone says she is “responsive to the passion of the grassroots, advocating for Medicare-for-All, free college and criminal justice reform,” which are views that are popular among many young people. While a potential female president of color is a phenomenal and welcomed change many view as beneficial to our country, Harris has historically worked as a federal prosecutor, which has thrown many people off as the United States prison system worked to enable the mass incarceration that disproportionately discriminates against people of color. Julian Castro, a Democrat currently serving as mayor of San Antonio, TX, is also in the running. He was a former U.S. Secretary of Housing and Urban Development under the Obama administration. He currently holds the potential to be the youngest President in U.S. history, as well as one of the only Latinx representatives for the race. While many are excited about his potential, the only elections he has been involved in have been on a very local level, which could indicate a lack of experience for a Presidential seat. 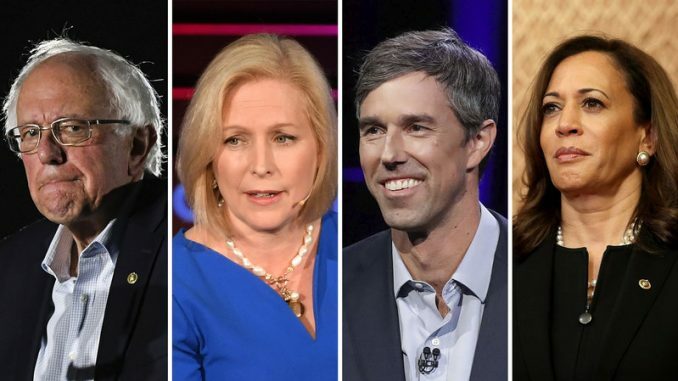 Other candidates include New Jersey Senator Cory Booker, New York Senator Kirsten Gillibrand, Former U.S Representative John Delaney, U.S. Representative Tulsi Gabbard, and mayor of South Bend, Indiana Pete Buttigieg, along with multiple others. Many people have discussed the potential of former Vice President Joe Biden, as well as the 2016 Independent Candidate Bernie Sanders running again, although both have yet to confirm anything. People were eager to see Beto O’Rourke put his name in the running after losing the midterm elections to Ted Cruz, but he has not confirmed anything either. With all these candidates, where do we start? It is important to research all the candidates, and follow them on interviews and in debates once those start happening. It is vital to focus on all angles, and analyze candidates from multiple platforms to see where their politics truly lie. If you’re still stuck on who to choose, sites like isidewith.com allow for you to take quizzes to find who you side with best out of all the current candidates based on answering questions on various political topics. Being informed is the best way to make the best decision when it comes to signing off on the ballot.